Graduate of KFUPM in Petroleum Engineering and has more than three years of research experience with Center of Integrative Petroleum Research. 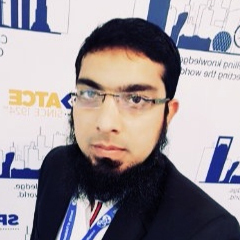 Originally graduated from NED University of Engineering and Technology in Karachi, Pakistan in 2010. Since 2014, Zaid has been working on the establishment and management of the Digital Rock Physics lab at CIPR. In addition, leading Lab Technical Support Division of LTSS. Coordinating all the procurement and maintenance of lab equipment, supplies and inventories of labs and providing technical support to all CPG labs. BE, Petroleum Engineering, NED University of Engineering and Technology, Pakistan, 2010. Patent Granted – US9920238 – Fluorosurfactant Extraction Process for Carbonate Reservoirs – 2018. Inventors; Zaid Z. Jangda, Abdullah S. Sultan. Patent Granted – US9719009 – Oil Recovery Processes at High Salinity Carbonate Reservoirs – 2017. Inventors; Zaid Z. Jangda, Abdullah S. Sultan. Jangda, Z., & Sultan, A. (2016, September 26). Performance Comparison of Novel Surfactant-scCO2 Systems for Oil Recovery in High Salinity Carbonate Reservoirs. Society of Petroleum Engineers. doi:10.2118/181314-MS.
Jin, G., Pérez, H. G., Agrawal, G., Khodja, M. R., Ali, A. Z., Hussaini, S. R., &Jangda, Z. Z. (2015, March 8). The Impact of Gas Adsorption and Composition on Unconventional Shale Permeability Measurement. Society of Petroleum Engineers. doi:10.2118/172744-MS.
Jangda, Z. Z., Sultan, A. S., Gajbhiye, R. N., Abu-khamsin S.A., & Arshad, A. (2014, March 31). Evaluation of Fluorosurfactant Performance with Super-Critical CO2 Flooding for High Salinity Carbonate Reservoirs. Society of Petroleum Engineers. doi:10.2118/169725-MS. Distinguished Professional Staff Award – 2016 – 2017 – KFUPM. Third Position in SPE Middle East & North Africa Student Contest (Graduate Level) for presentation titled “CO2/surfactant injection for Enhanced Oil Recovery” at the North Africa Technical Conference, Cairo, Egypt (NATC-2013). First Position in Saudi Arabia SPE Student Contest (Graduate Level) for presentation titled “Carbonated Water Injection for Enhanced Oil Recovery” at KAUST.